This schematic shows a simulation of what the roundabout would look like on the north side of the Highway 89 bypass. “The top five online” is a weekly report of the top five stories the previous week at www.tahoedailytribune.com, in terms of overall page views and reader interest as shared through social media. To stay up to date with our online news, visit www.tahoedailytribune.com, or follow the Sierra Sun-North Lake Tahoe Bonanza on Facebook. TAHOE-TRUCKEE, Calif. — Below is a recap of the top stories from March 23-29 at http://www.tahoedailytribune.com. Authorities are offering a $1,500 reward for information leading to the arrest and prosecution of a man who robbed the Village Pharmacy in Incline Village at gunpoint Tuesday, March 24. According to the Washoe County Sheriff’s office, the suspect demanded an unspecified amount of pharmaceutical products before fleeing. No one was hurt in the incident; the suspect remains at large. 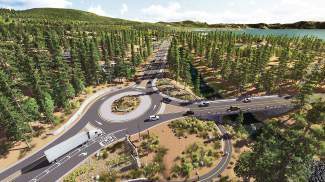 The preferred alternative for the Fanny Bridge/Highway 89 overhaul in Tahoe City proposes a new or rehabilitated bridge over the Truckee River and realigning Highway 89 by adding a two-lane bypass through the 64 Acres lot in National Forest System land. Further, three new roundabouts are proposed, including one at the “Wye.” Various government agencies are expected to vote to OK the project by the end of April. The parents of murder victim Matthew McMaster, 24, of South Lake Tahoe continue to deal with delays in the cases of two defendants accused of participating in his murder and disposing his body. The men are being prosecuted for their alleged involvement in the July 2012 murder of McMaster during a physical altercation at the residence he shared with one of the men in Phoenix. Two vehicle wrecks on Tuesday, March 24, near Tahoe’s South Shore landed two people in the hospital, while another suffered minor injuries. The first accident occurred at about 3:45 p.m. on U.S. Highway 50 near Zephyr Cove, and several lanes were blocked for about 30 minutes. Two people were hospitalized and released by Friday. The second incident occurred two hours later in the area of Kingsbury Grade Road and Pine Ridge Road. No one was hospitalized.